Zimbabwe’s political parties Tuesday signed a “peace pledge” committing to peaceful campaigns for the July 30 general election. Zimbabwe’s political parties sing the national anthem before signing a “peace pledge” the National Peace and Reconciliation Commission says is aimed at ending violence that characterized the country’s previous elections. Absent from the ceremony Tuesday were the two leading candidates for the July 30 election, President Emmerson Mnangagwa of the ZANU-PF party and Nelson Chamisa, the leader of the Movement for Democratic Change Alliance - a coalition of opposition parties. 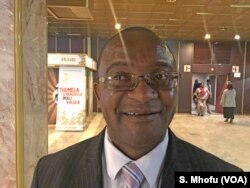 MDC-Alliance Secretary-General Douglas Mwonzora said the candidates were represented by party leaders. MDC-Alliance Secretary-General Douglas Mwonzora says that the “peace pledge” will ensure a peaceful election. Police dragged the leader of the 1980 Freedom Movement party, Francis Danha, out of the ceremony for protesting that the July 30th elections are a sham unless the Zimbabwe Electoral Commission resigns. Francis Danha protesting on June, 26, 2018 to the National Peace and Reconciliation Commission and other political parties that the country’s July 30 elections are a sham unless the Zimbabwe Electoral Commission resigns. 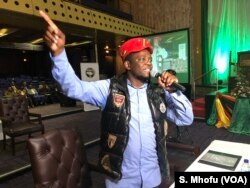 Opposition parties have long accused the ruling ZANU-PF party of manipulating the Zimbabwe Electoral Commission to ensure victory at the polls. Is Zimbabwe Heading for More Disputed Elections?